When you deal with chronic pain from a damaged disc and conventional treatments don’t give you relief, it may be time to consider the benefits of an artificial disc replacement. J. Michael Graham, Ph.D., M.D., offers consultations for disc replacement surgery at Northwest Spine Center in The Woodlands, Texas. 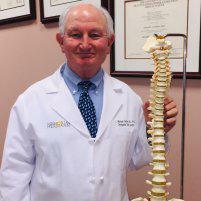 He provides comprehensive surgical care, with the goal to alleviate pain and increase your mobility in the long-term. Learn more about the benefits of artificial disc replacement surgery by calling the office, or book online today. An artificial disc is a device designed to replace the natural disc in your spine. If you suffer from disc damage or a degenerative disc disease, you may eventually need surgery to replace your disc. With artificial disc replacement, Dr. Graham surgically removes your damaged disc and replaces it with an artificial disc. The artificial disc is made of a special type of metal and plastic that is safe for your body. The artificial disc works just like the natural disc. Why do I need an artificial disc replacement? For any spine condition that causes pain or limits your mobility, Dr. Graham will likely recommend conservative treatments, like medications and physical therapy, before opting for surgery. You may not be a candidate for disc replacement surgery if you have spinal deformities, like scoliosis, or advanced joint disease. Dr. Graham can evaluate your condition and recommend surgery based on your medical history and the severity of your pain. What can I expect for recovery after artificial disc replacement? Cervical spine artificial disc replacement is an outpatient surgical procedure that takes about 1-2 hours, then you go home. Lumbar spine artificial disc replacement is also a minimally invasive surgical procedure that takes about two hours and you spend one night in the hospital. Dr. Graham often encourages people to start walking around soon after surgery to help speed up the recovery process and help you regain muscle strength to better support your spine. It may take several weeks for you to get back to your usual routine. During that time, Dr. Graham may recommend starting physical therapy to improve your flexibility and enhance your overall functionality. He also monitors the progress of your healing to ensure you are no longer living with chronic pain. If you have limitations or persistent pain from spinal damage or disease, schedule a consultation today. You can book an appointment conveniently online or by calling the office.